A navel piercing can be an eye-catching personal style statement, but it also has its fair share of complications. 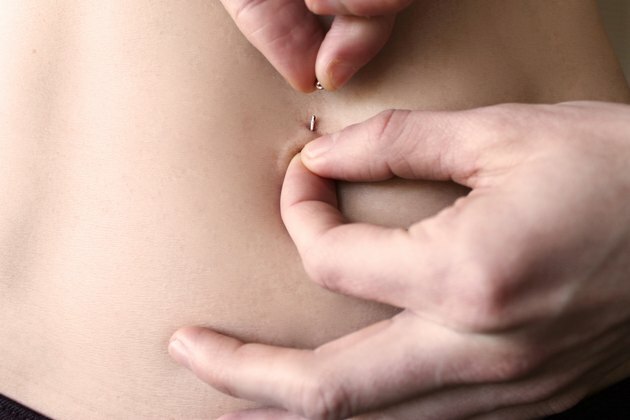 The American Academy of Family Physicians warns that navel piercings can cause infection and hypertrophic scarring, especially with weight gain or pregnancy. If you're ready to remove your navel piercing for personal or health reasons, do so with the utmost care for cleanliness. Making sure that the piercing stays clean will ward off potential infection and further scarring. Wash your hands, your navel and the visible parts of the navel jewelry with antibacterial soap. After the area dries, douse a cotton ball in rubbing alcohol and apply to your navel and the jewelry to further sanitize the area. The Center for Young Women's Health notes that you should never let anyone else touch or remove your navel piercing, unless it is a piercing professional. Wiggle the bar of your navel jewelry back and forth and twist it to ensure it moves easily. If you have trouble moving it, your navel piercing may be infected, with the jewelry being crusted over with discharge. You may want to visit a piercing professional or dermatologist to have it removed. Locate the smaller non-decorative ball that is typically found at the top of the jewelry. It should be located above the tiny flap of skin before it connects to the bar that goes through the skin. Hold the bar tightly against your body and unscrew the small ball from the bar. Set aside carefully so as not to lose it. Tug the larger bottom decorative ornament so the bar beings to slide through the navel piercing. Gently pull until you've freed the bar and replace the top ball to keep the jewelry together. Replace immediately with a new navel ring or slide in a flexible spacer if you're going to keep the piercing. If you plan to let the piercing heal over, leave the piercing clear, but continue to disinfect it daily. Wash the area with antibacterial soap once more to clean away any germs or bacteria that may have been introduced through your hands or the jewelry.